I’d spend so much time on the Memorial Canvas & Frames that I didn’t have enough time to even start the next project I’d planned (still in the works, by the way) before the next deadline came due, so I needed a quick fix for an impromptu project. 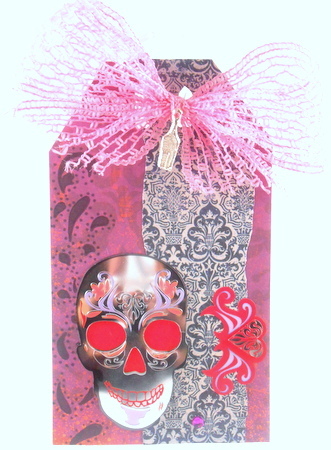 Enter the concept of highly-decorated tags! Tags were never really my thing back when I paper-scrapped a lot. They were nice to have and could fill some space on a page quite nicely, but I never really got into them the way others did. I think I’ve now changed my mind on the “simple” tag. Instant gratification gives you a creative boost for other projects. They can be used to decorate packages, gift bags, or decorations. The small size means there’s not a lot of space to agonize over. Tags are a great way to use up miscellaneous supplies. 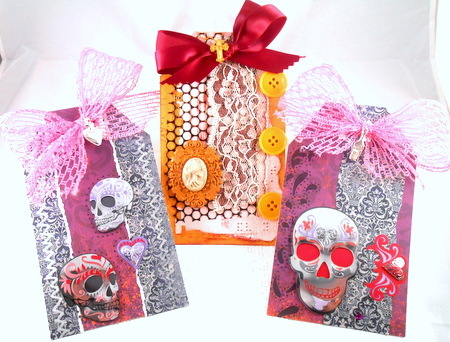 In the case of the Dia de los Muertos kit, it was the 3-D skull stickers. They’re cool stickers with a little bit of a girly-biker vibe, and I loved that they were part of the kit, but they were the type of thing I’d squirrel away and not use because either I didn’t have a specific use for them or I didn’t want to use them up. Plopping them on some tags meant I got to use them in a no-pressure situation, and I still get to keep the pretty tags around until such time as I find a better home for them. It’s not quite the same as having your cake and eating it, too, but it’s pretty darn close! For the Garnet & Gold cameo tag, I stamped the background with the VLVS stamp, highlighted the texture in the braille paper with cranberry ink, then layered it all with woodgrain punchinella and brown & cream lace, stitching the looser bits up along the top edge. The cameos in this kit kinda make me want to start wearing pins and brooches again, but I gave this set up for the tag and added some buttons and ribbon from my own stash to round it out. In the center I sewed one of the cross beads in the kit and called it a day. The two pink & black tags exist solely to highlight the multi-layer skull stickers. 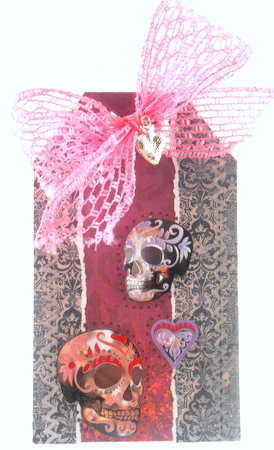 For Mr. Staring Skull, He got embellished with a heart/motif sitcker from the same pack, turned on its side, a purple gem, some pen detailing on the other side traced through the sugar skull mask, a bow from wired mesh ribbon, and a bottle milagro. Cheers, dude! The talking heads, on the other hand, got a layered heart sticker, some faux stitching care of a silver Sharpie, a matching mesh bow and a heart milagro. So how ’bout it? Why not drag out those unused stickers and supplies and make some tags? Looks great! I hope you had a good Thanksgiving!